This followspot rental is a popular spotlight for stage events. 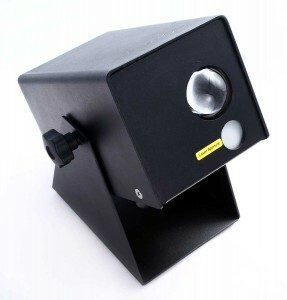 It uses a 575-watt lamp with a parabolic reflector and focusable and zoomable lens for great flexibility. It’s designed to be run by an operator, with an easy to use handle on the back of the unit and controls along the top, back, and sides. 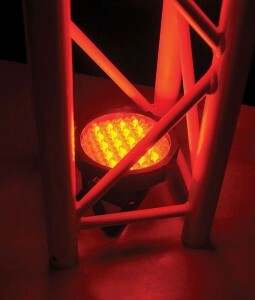 The spot light is fully dimmable and includes an iris for precise size control. Focus adjustments allow for a crisp beam or a soft edge. It runs on standard 110v household current. We include the FS-1000 follow spot in mounting yoke, a power cable, and a stand. You’ll probably want a heavy-duty extension cable for most situations. If you’d like to run this light from a lighting board, you’ll also need a DMX dimmer pack and DMX cables. This spotlight can get hot, and care should be taken to keep it away from flammable materials. A small internal fan cools the unit whenever it is plugged in. Our experienced lighting technicians would love to help you design, set up, and operate your stage lighting rental. Please call us for details. LED PAR 64 lights are a great light for washing stages, walls, and anywhere where you’d like a pop of color. Create custom colors with red, green, and blue (RGB) LEDs. Use the controls on the back or a DMX-512 lighting control system. These PAR 64s are low profile and mount easily on the ground with the split stand. LED lights are cool to the touch, and these draw much less power than traditional PAR 64s. They are a great choice for uplighting. As accent uplighting, we suggest one every 4-6 feet of wall. For a more even wash, they should be closer together. If you choose a custom color, we can set the lights for you before you pick up your rental. If you prefer, we can even send a tech to handle delivery and setup for you. The prices below are for one light with power cable, without stands or clamps. Discounts are available for rental orders of 8 or more. Our 6″ 500w/1000w Strand fresnel spotlights include gel frames. 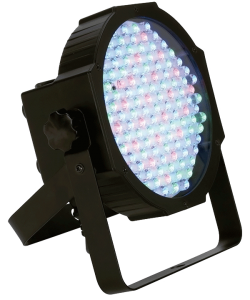 The high output, clean edges, and focusability make them popular as stage and event lights. 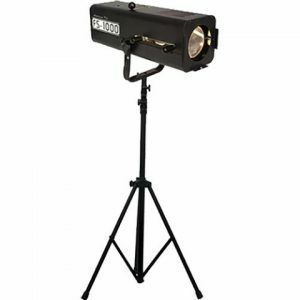 We rent this spot light with a baby receiver to mount on a stand, or C clamp to mount on a pipe up to 2″. Spot lights are a great choice for stage lighting, when you want to control spill and keep light off of surrounding areas. 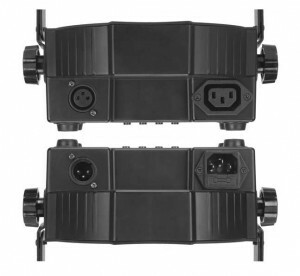 All of our lighting equipment uses standard 110V edison connectors. Barn doors are also available. Discounts are available for packages with 12 or more lights. Our experienced lighting technicians are available to help you design, set up, and configure your stage lighting rental, as well. Create a beautiful night sky lighting effect indoors with a Blisslight 15 Blue rental. This light creates a beautiful blue nebula effect with bright, slowly moving stars. A Blisslight 15 will cover an area about 25’x25′ when used in a room with 10-foot ceilings. The Blisslight pairs very well with LED uplighting for a complete room transformation. Balance the light level with other lights in the room for different dramatic effects. 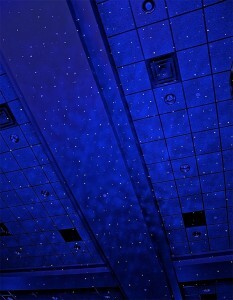 The Blisslight night sky effect is incredibly popular for weddings and evening events. You can have one of our technicians deliver, set up and take down your lights, or you can rent your lighting equipment without a crew. The prices below are for individual lights, but we can offer discounts for larger rental packages. 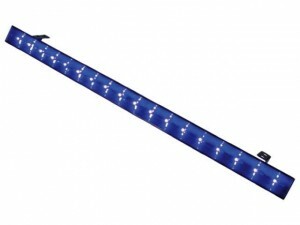 This UV blacklight bar is an easy-to-use light that covers a larger area than most UV blacklights. The included adjustable feet allow you to mount it on the ground, without a stand. The light shines a wide 120-degree beam. Since it’s LED, it stays cool and is safe to use all night. It’s also controllable via an included remote control, or with a DMX controller. We suggest using these along outside walls, spacing them every 10-15 feet for even blacklight coverage. They can point in towards the room or be used as an uplight, as well. 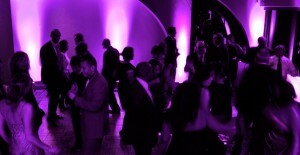 For glow parties, they work very well when combined with stand-mounted blacklights used overhead. 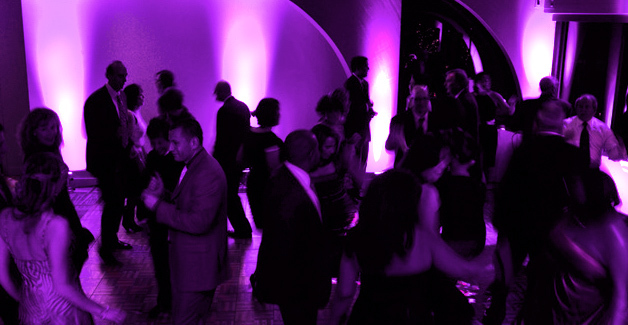 Make your party, dance, or event glow with an LED blacklight rental. 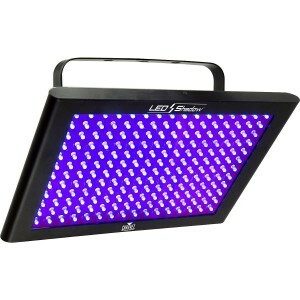 This UV light looks great at weddings, a DJ booth, or anywhere you want a wash of ultraviolet blacklight. Since it’s LED, it stays cool and is safe to use all night. Controllable via 3 DMX channels, it’s easy to control dimming and strobe functions. Output on each of these blacklight LED panels is moderate, we suggest using one unit for every 100 square feet you’d like to cover. This type of light mounts best overhead to truss or pipe, one lightweight pipe clamp is included. 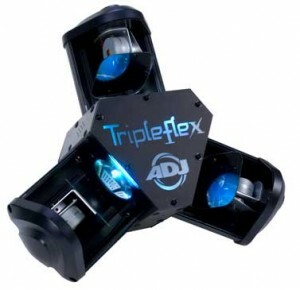 The American DJ Tripleflex is a great feature light that combines four colors in a moving moonflower effect. It’s programmable by DMX, or you can set it to sound activated mode for simple operation. 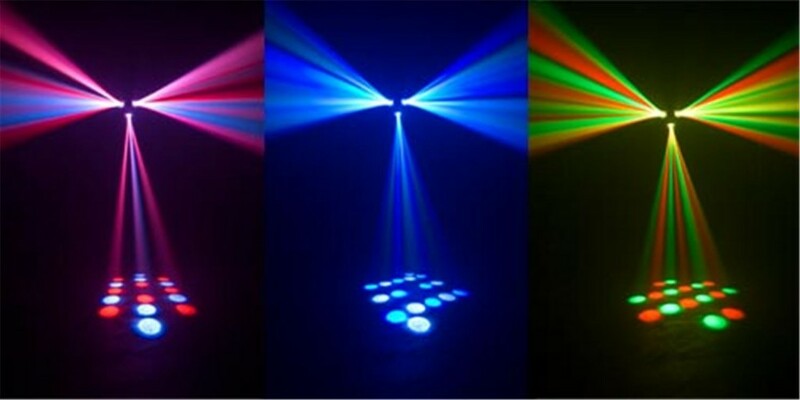 This light looks great at a DJ booth, and with a little fog it can take over the room. This is an LED light with low power draw and low heat. It’s on the big side, so we include a standard pipe clamp for mounting. We suggest mounting to truss or schedule 80 pipe. Rates start at $24 for one day. Call or email for availability. When you hear “moonlight,” “star light,” or “candlelight,” you probably think of romance. 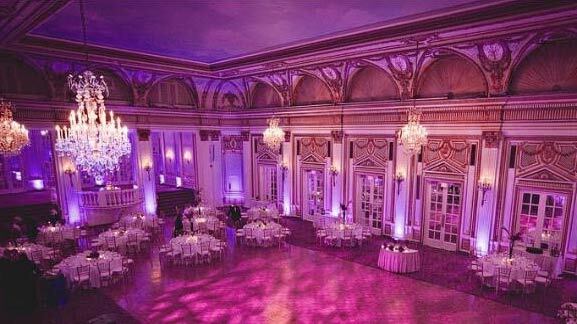 The emotional experience your guests have at your wedding is shaped by the light in your event space. Set the mood, improve your photos and video, and make your wedding space look unique and inviting with a custom wedding lighting package. We can light any size wedding venue. Our services include delivery, setup, and return. We also offer budget-friendly do-it-yourself lighting options starting at just a few hundred dollars. We’ve lit weddings and other events at the Pilot House at Discovery World in Milwaukee, the Bluemound Golf and Country Club in Wauwatosa, the Pritzlaff Building, Lakefront Brewery, and many more. Let us help make your Milwaukee wedding beautiful and memorable. Contact us today for a free consultation. Complete the fields below, or call (414) 939-3653. 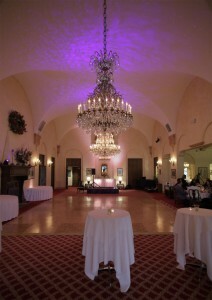 We offer LED uplighting rental packages for weddings and events. You can create any custom lighting color you want and wash the walls and ceiling with vibrant colors. Boost the energy in the room and add visual excitement with LED uplighting. Our lights run on batteries, so they can be put anywhere, without cables, heat, or other dangers, and they’ll run for hours. A remote is included, so operating your lights is easy. You can have one of our technicians deliver, set up and take down the lights, or you can save money and handle the setup yourself. We can even go over how to get the best results and set your custom colors with you when you pick up your rental from our office in downtown Milwaukee. Our most popular rental packages use between 12 and 64 lights, depending on the size of the space and the effect desired. Order any number of lights you’d like and we’ll put a rental package together for you. The prices below are for individual lights, but we can offer discounts on orders of 12 or more. 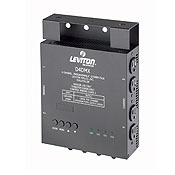 The NSI/Leviton D4DMX is a DMX-512 device, most useful for controlling stage lights for theatrical performances, small stages, and houses of worship. 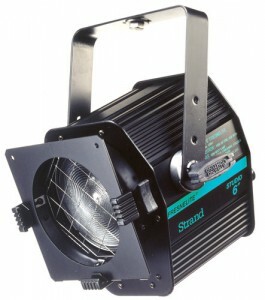 Compatible with any devices that can be dimmed, it is a useful way to add DMX features to a “dumb” stagelight. Easy one-touch control of DMX channel and a simple readout make setup a breeze. Operates in 1, 2, or 4-channel mode and the basic chase modes can be used without a DMX controller. 1200 watts/channel, 2400 watts total. Please specify whether you’ll be using a 5-pin or 3-pin DMX configuration. $35/$70/$105 for 1/3/7 day rentals. Call or email for availability.